At this wonderful job page, you will be having the job from Finca Microfinance Bank Jobs 2017 For Branch Manager Latest Advertisement. 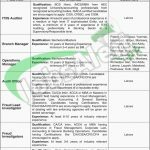 One of the well-reputed banks named Finca Microfinance Bank is seeking to recruit the well disciplined eligible, caliber and adroit applicants are required to apply for the following posts which are named as (IT/IS Auditor, Branch Manager, Operations Manager, Audit Officer, Fraud lT Lead Investigator, Fraud Investigators and Construction Auditors) are the current vacancies which needs to be filled with overall qualification of BCS (Hons), MCS/MBA/M.com, ACCA/CA/ACMA from HEC recognized university is required to apply for such posts. Candidates will be placed in different cities. Attractive salary package and growth offers will be given to the applicants. Now, I will highlight it's further details below. Finca Microfinance Bank Limited is an International Bank which is operating in 3 continents and 21 countries across the globe and is having the network of 120 touch points in 95 cities of Pakistan. Being a Private Bank it offers Private jobs of all educational levels. Applicants are required to apply online from the three official sources such as http://www.finca.pk/careers, www.rozee.pk or from . The last date for applying is 17th September 2017. Enterprising applicants are highly encouraged to apply. The bank authority reserves the right to cancel the application or can alter the given criteria. So viewers if you wanted to be part of such internationally reputed bank and you fulfill the criteria then apply as soon as possible and be the first of joining Finca Microfinance Bank.